Would you like to screen 'That's the story' at your institution? 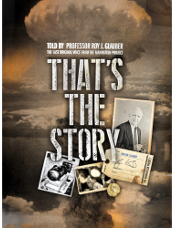 Nobel laureate Prof. Roy J. Glauber is the last living scientist from the Theory Division of the Manhattan Project at Los Alamos. His clear, fluent and articulate narration brings first hand information on the life at Los Alamos, the main scientific characters there, the Trinity test of the first ever nuclear weapon, the bombing of Japan and the political aftermath of the project. Glauber's account is documented with audiovisual material recently declassified from the Los Alamos Archive. In October 1941, President Roosevelt approved a crash program -known as the Manhattan project- to develop an atomic bomb. Nobel laureate Roy J. Glauber was only 18 when he joined the project. He is the last living person from the Theory Division at Los Alamos and the last person to tell first hand his insight of how the bomb was constructed. Glauber's perfect narration covers the daily life at Los Alamos, the relation among the famous scientists (Oppenheimer, Teller, Fermi, Bethe, Feynman,...) that worked in the project and the feelings that came to them on the day of the Trinity first test. He further goes into the political aftermath, including the hearings against Oppenheimer. Glauber's account is only punctuated by original videos recently declassified at the Los Alamos Archive. The documentary 'That's the story' brings, in some sense, the last true voice telling the story of how the first atomic bomb was made. This documentary is currently distributed by Twelve Oaks Pictures SL.